I'm just stopping by quickly to share a little loveliness that I popped together this morning. In the middle of re-organising my stash from Blue Moon Beads, I had an idea. And let's face it, everyone wants an excuse to stop tidying, don't they? The Blue & Bronze Teardrops were part of a pretty earring component set (I've still got some lovely filigree pieces to work with!) but I wanted to combine them with the pre-made Blue & Bronze Pendant from the Blue Sky Collection. Don't they work so well together? So, to create the focal, I've attached the Blue & Bronze Pendant to a Bronze Twisted Jumpring. 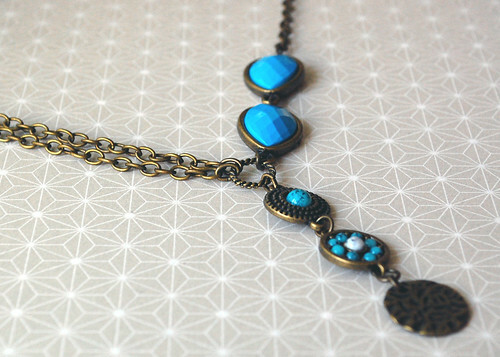 I then added the two Blue & Bronze Teardrops and a length of Blue Moon Beads' Bronze Chain to one side. I've added two lengths of Blue Moon Beads' Bronze Chain to the other side, to ensure that the necklace is balanced well. I hate it when my necklaces start to twist around! Now, to carry on creating or to carry on cleaning? Oh, I love the turquoise and bronze combination. Creating or cleaning.... a common problem around here. I usually end up doing a bit of both. When you're creating beautiful things like that you just need to keep going. Very pretty :) And I think you know what my choice would be lol!